To help begin a better appreciation and understanding of the structure and dynamics of hnkhwelkhwlnet, “our ways of life in the world,” let’s consider an experience we may all have had, that of a “rainbow,” and then that of one few may have had, that of digging sqha’wlutqhwe’ – camas, Camassia quamash. And finally, let us briefly juxtapose hnkhwelkhwlnet with TK/TEK, “tradition knowledge” and “traditional ecological knowledge,” to identify two differences in these constructs. For a printable copy of Hnkhwelkhwlnet.pdf. The Rainbow. Re-imagine the last time you experienced an arc of richly-varied, vivid color, rising out from the ground, reaching into the sky, and then arching back down into the earth. What were the elements, if you will, “the participants,” and their relationship with each other, which allowed the phenomena you might call a “rainbow” to come into existence? Certainly moisture, the water molecules suspended in the sky, with light from the sun reflecting off those tiny droplets. What else? You, i.e., your physical ability was required, to visually perceive the light interacting with the moisture. And what else? You again, i.e., your cognitive ability was required to mentally recognize, conceive and conceptualize that the interaction of yourself, with the suspended moisture in the sky, relative to the sun’s light hitting those molecules, was indeed meaningful. You needed a word, an ideational construct. Anything else? How about a certain place, for a certain time. Your rainbow only had existence where these interacting elements aligned in a particular relationship with each other, i.e., you had to be at a place, on a landscape, in a particular angle relative to the light and the moisture. And your rainbow only had existence when these participants come together, aligned if only momentarily, as an unfolding event. The phenomena we call a “rainbow” has existence as a transitory intersection of those participating, anchored to a particular place, interjected by you with a particular construct infused with certain meaning. We interject, have a word, a “concept,” for these interactions that imbues the experience with semantic significance. We have, in essence, a miyp for it. The focus of hnkhwelkhwlnet is not so much on the participants, as discrete and concrete objects, as it is on their temporal relationships with each other. Would a “rainbow” have existence if any one of these relational participants were missing? The “rainbow” is not reducible to the solitary qualities of its empirical, physical property’s; Aristotelian materialism does not flourish in this reality. The “rainbow” does not have existence autonomous from human participation; Descartes’ Cartesian Dualism does not estrange “body” from “mind” in this reality; no separation of behavioral action from knowledge. The “rainbow” has existence not as a distinct physical object in the sky, nor reducible to its ideational configuration, but as an unfolding event of the many in relationship with each other. The story of the "rainbow" is from Frey and et alia 2014. Camas. How alike is the reality of the “rainbow” from that of digging sqha’wlutqhwe’ ? For the Schitsu’umsh, sqha’wlutqhwe’ (camas, Camassia quamash), has existence only when aligned in a strong reciprocal relation as a “kinsmen” (Schitsu’umsh and Frey 2001:6, 154-55, 172). 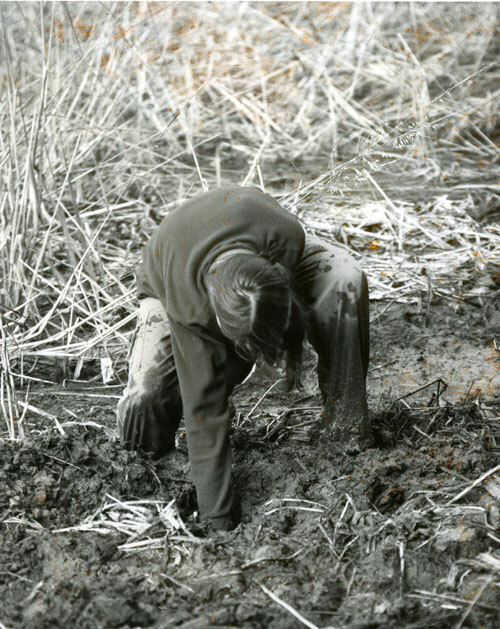 For the human kinsmen, there is a responsibility for acquiring a vast level of knowledge and teachings, of miyp, including a keen awareness of the seasonal cycles and unique weather patterns that effect location and timing of the digging, as well as the obligation for certain acts of prayer and respect during and after the digging. 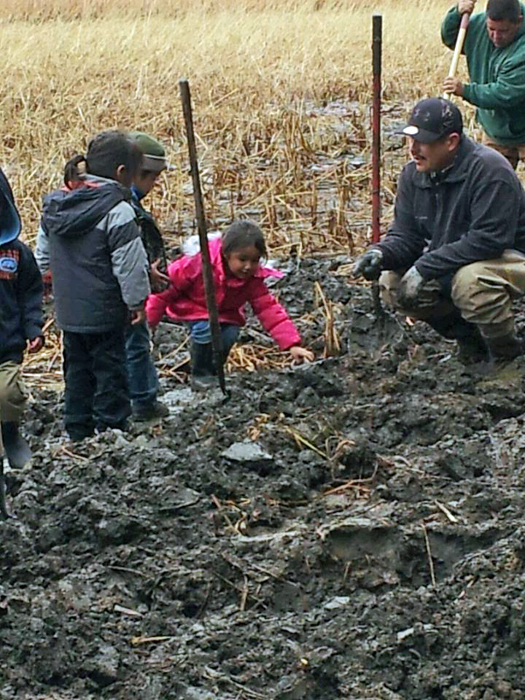 Before the pitse’ (digging stick) pierces and loosens the earth around the camas tuber, a prayer to k'u'lntsutn (the Creator) and the sqha’wlutqhwe’ is given, asking “permission” to gather the tubers, asking if we could gather his fruits. A small gift of tobacco might also be offered. Only that amount of camas needed by the family would be dug, never more. For its part, the sqha’wlutqhwe’ reciprocates, responding with its own “gifts” of nutrition, feeding the body and the spirit of human kinsmen. 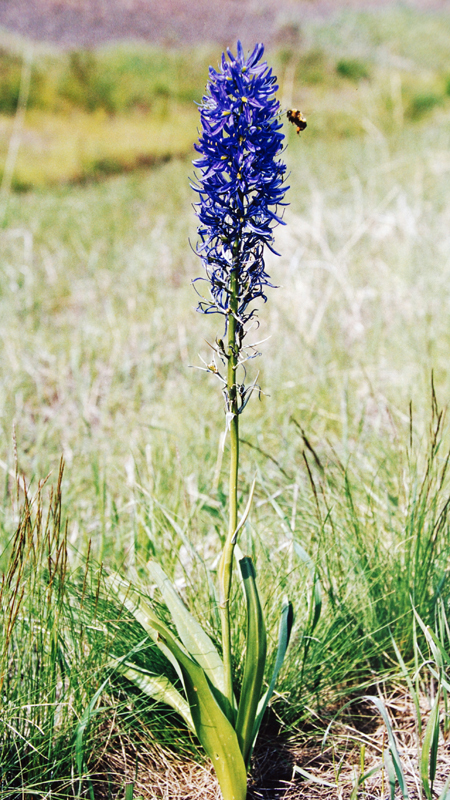 Camas, when annually dug in this Schitsu’umsh manner, responds by producing larger tubers when compared to camas left in the “wild,” void of human interaction. Once dug and prepared, the human also has the responsibility of sharing the camas with those in need, and of not hoarding it for self-gain. Are not both the “raindrops” and “fibrous bulbs of Camassia quamash” made up of similar elemental, constitute physical properties, just simply arranged differently, perhaps most distinguished in that one set of properties is on a much slower temporal scale – a slow growing plant? If a “rainbow” is the result on our interaction and particular relationship with raindrops and sunlight, would it not follow that a “sqha’wlutqhwe” is also the result of our experiential interaction and particular relationship with a relatively hard, fibrous growth, the result of our physical and conceptual interactions with it? Consider that hnkhwelkhwlnet refers to “our ways of life in the world,” i.e., the many participants are a part of a connection with the many others, in a particular place, and not apart from them, separate from that place. For the Schitsu’umsh, this particular physical interaction entails the behavioral acts of prayer, the acts of digging, the acts of cleaning and storing, the acts of sharing the sqha’wlutqhwe’ with those in need, with the elders and children, and the acts of consuming and providing nutrition and health. It entails acts with both physical and spiritual others, with a “brother,” and with the Creator, though the event is not reducible to either the physical or spiritual. The conceptual interaction with the fibrous growth anchors the event with the miyp that guides the behavioral acts and renders the interactions meaningful, though the event is not reducible to the ideational. The entirety of this unfolding event of the many relationships is hnkhwelkhwlnet. TK and TEK. In an understanding of hnkhwelkhwlnet, it should be considered that the structure, dynamics and meaning of Schitsu’umsh hnkhwelkhwlnet has similarities with, as well as distinctions from other ways of conceptualizing Indigenous knowledge and practices, as for example, traditional knowledge (TK) and traditional ecological knowledge (TEK). In the 1999 ground-breaking and seminal work by Fikret Berkes, Sacred Ecology (2012), the foundations and scope of TK and TEK are identified and their implications discussed. Berkes’ study has launched a series of insightful, on-going applications and modification of TK by himself and other scholars. In Mason and et alia (2012), we have a wonderful discussion of TK, in contrast and in association with scientific ecological knowledge (SEK), as applied to forest health and wildfire. In the "Traditional Knowledge Protocol" Agreement that framed the research for this “Schitsu’umsh Relationships with Their Dynamic Landscapes,” i.e., Sqigwts project, still another TK extrapolation from the Indigenous is brought forth. Our intention here is not to provide an extension comparison between hnkhwelkhwlnet and TK/TEK, but simply provide a cautionary note. How the tried and true has been successfully developed and applied in other contexts, may not be fully applicable in any given context. Each Indigenous community may have its own path to what ultimately for them is most cherished and real. A conceptualization of Indigenous knowledge and practice is best the result of what the Schitsu’umsh call, stmi’sm, being attentive and carefully listening, to build a consensus of the many local participants. Evolving from earlier research and acknowledging variations on the theme, Berkes defines “traditional ecological knowledge as a cumulative body of knowledge, practice , and beliefs, evolving by adaptive processes and handed down through generations by cultural transmission, about the relationship of living beings (including humans) with one another and with their environment” [author’s italics] (2012:7). It is distinct from the broader more inclusive term “indigenous knowledge,” which is often defined as unique to a given Indigenous community, and within which the TEK’s ecological “land-related” aspects are but one “subset” category. While Berkes notes that among the Australian Aborigines TEK is more than a body of knowledge, it is a “way of life,” the verb-based act of living and doing, the emphasis in the definition and application of TEK refers to the “ways of knowing (knowing, the process), as well as to information (knowledge as the thing known)” (2012:8-9). While the similarities are far greater than the instances of their differences, e.g., similarities such as "an intimate relationship with a landscape" and "disseminated intergenerationally," let us consider three cautionary contrasts between hnkhwelkhwlnet and TEK. First, both TEK and TK focus on “knowledge,” on the ways of knowing, while hnkhwelkhwlnet focusing on “ways of living,” with knowing and doing indistinguishably interwoven. The ideational conceptualizing and knowing, the miyp, are not separated from the “living,” from the "doing" 'itsk'u'lm, from the experiential relational connections of the many participants. This would follow the Schitsu'umsh understanding that hnkhwelkhwlnet is devoid of a “mind-body” Cartesian Dualistic premise. When the knowing becomes an isolate, it can too easily and inadvertently be objectified, given a concreteness, as if an “object,” which is inconsistent with transitory character of hnkhwelkhwlnet. Second, while observing TEK over time, as in the context of climate change, Berkes asserts that it is “evolving by adaptive processes,” it is “constantly evolving” (2012:190). This is also the case for hnkhwelkhwlnet. But the distinction resides in at what level the changes are occurring within the body of knowledge and practice. As will be introduced to you shortly in the 3-D Landscape, hnkhwelkhwlnet provides for the “flesh and muscle” to adjust and adapt to various forms of change, while maintaining its unflinching miyp teachings, retaining its steadfast “bones.” As a tree, its trunk is firmly anchored to the earth, with branches bending with the wind, with branches from all-together different trees grafted onto its trunk, embracing change. Stable, yet dynamic. 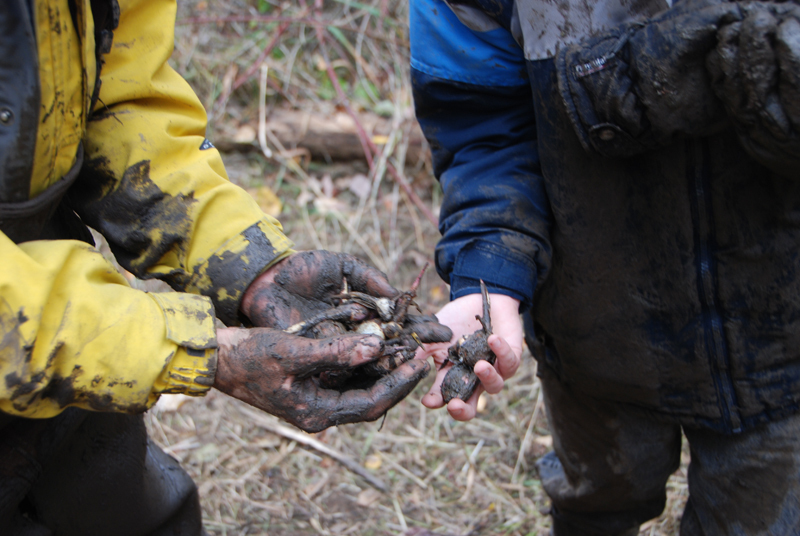 The constructs of Traditional Knowledge (TK) and Traditional Ecological Knowledge (TEK) offer invaluable insights and should be used in conjunction with a local Indigenous community’s understanding of their ways of knowing and ways of living. A conceptualization of Indigenous knowledge and practice is ultimately that which results from stmi’sm, from being attentive and listening, to build a consensus of the many local Indigenous participants.